Poor old Docklands. Remember the burning luxury yacht last month? 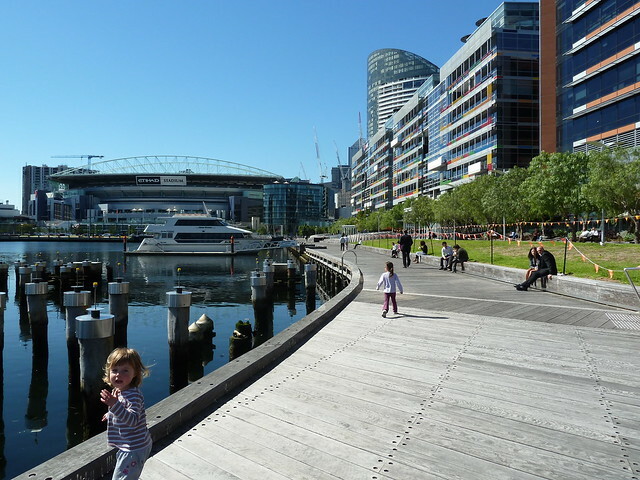 This tweet pretty much sums up the mood about our waterfront precinct. The problem with these manufactured areas (think Southbank and Fed Square) is they don't really develop naturally. 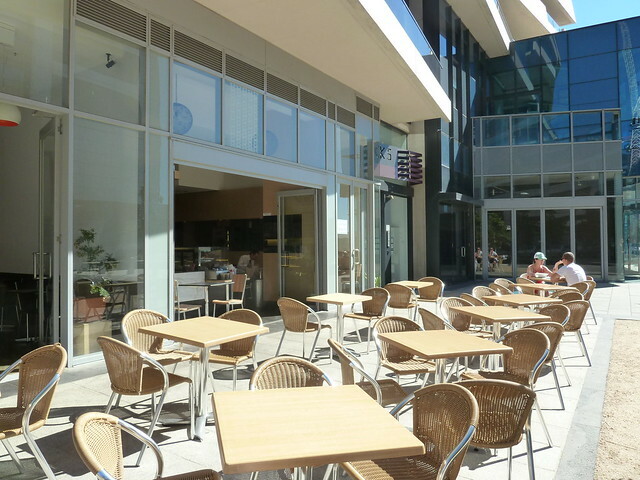 In food terms, they open ready-populated with cafes and restaurants that have been installed to hit certain price points and not much else. I was at Fed Square recently and asked the usher at ACMI, "Where's the best coffee place here?" She looked at me helplessly and we both smiled. "Degraves Street?" she finally offered. 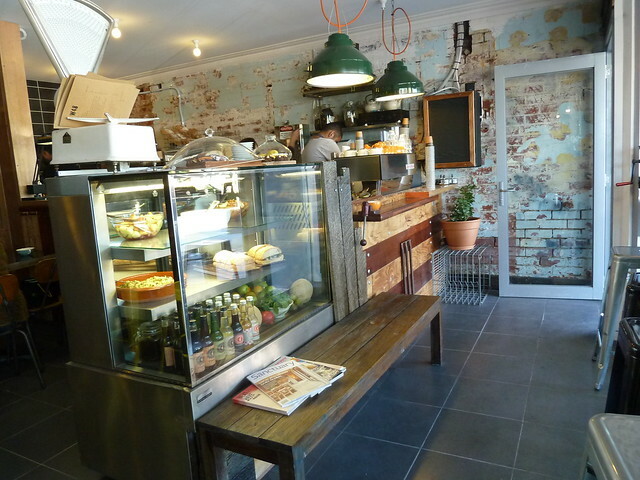 That's why VinTam's Bakery, tucked away in Docklands, is really exciting. 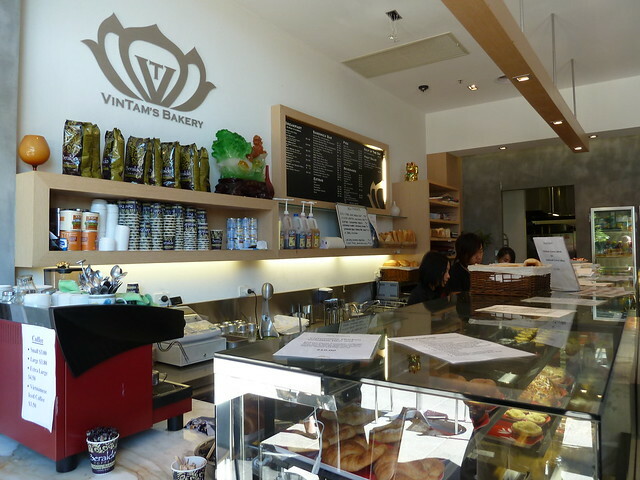 Walk past endless cookie-cutter panini bars and you'll come across this bakery and Vietnamese cafe, so popular it has reversed the trend and actually taken over an empty shop next door. They do good banh mi, from mixed ham to nem nuong (a springy, hot pink pork kebab) plus a menu of home-style Vietnamese dishes like ca ri ga (chicken curry), Vietnamese coleslaw and pho. 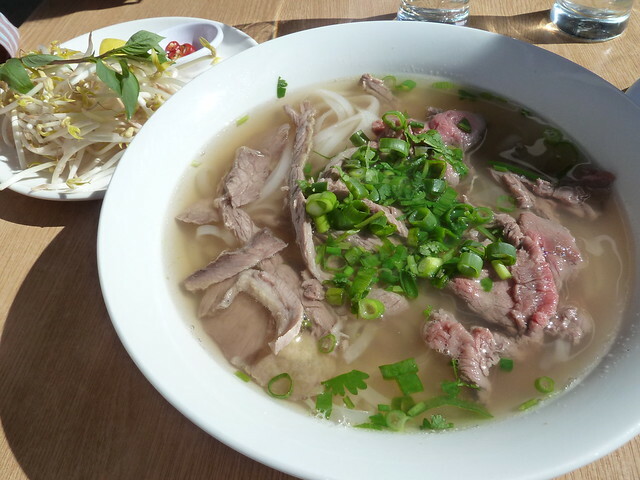 This sliced beef pho was delish and could hold its head up anywhere along Hopkins Street. The beef, tender brisket and rare wafer-thin slices, was tasty and the broth well seasoned and rich with hints of star anise. There was only one measly sprig of Thai basil, but perhaps the punters around here don't add it and so they're understandably cutting their losses. This banh mi was literally heavy in its paper bag. It was light on salad but so generous with yummy chopped chicken thighs luxuriating in a hoi sin glaze. The bread was proper and the chilli was plentiful. It's not Nhu Lan but a good effort all the same. 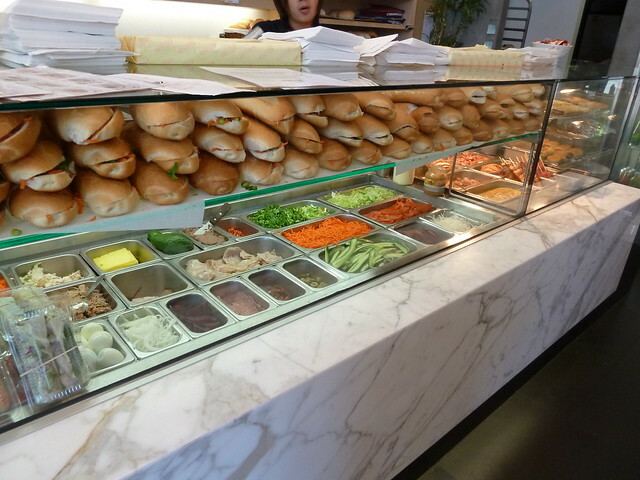 Other banh mi varieties are slightly cheaper at $5.50. 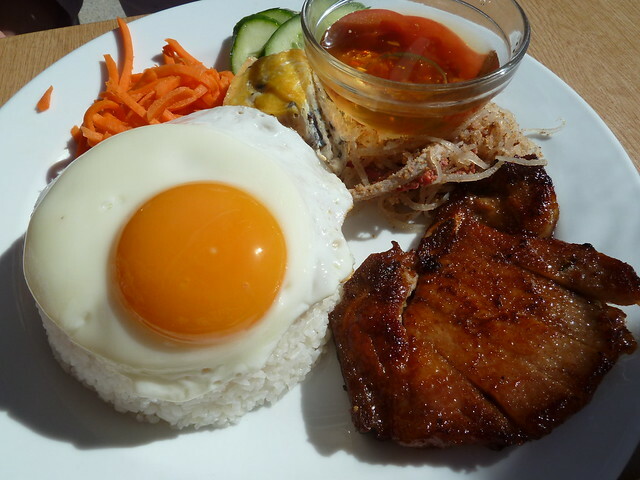 This classic com tam had a sweet and tender pork chop, generous broken rice and lovely sunny egg. 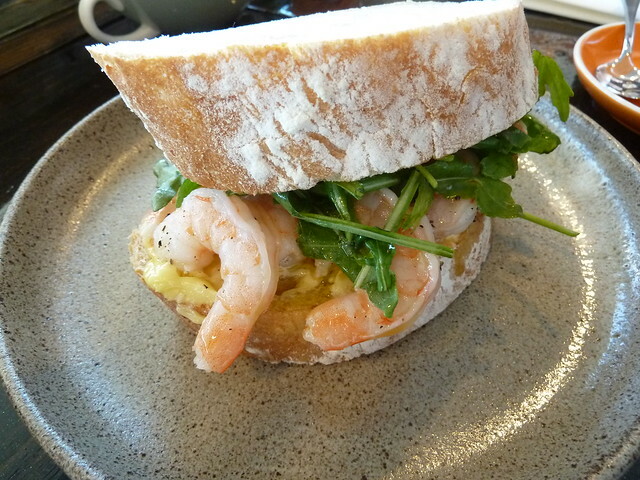 It didn't quite match up to Footscray but in the local stakes it's good. "Broken rice" is literally broken rice. It's long grain rice like jasmine, broken into pieces. It used to be a cheap by-product of the milling process but now it's produced on its own merits. It's stickier than normal rice and soaks up the dressing better. The staff are lovely and it gets really busy around office worker feeding time. There are multiple friendly people serving so it doesn't take long. If you score a sunny day, it's gorgeous to sit outside and there's a big area where the kids can run around. 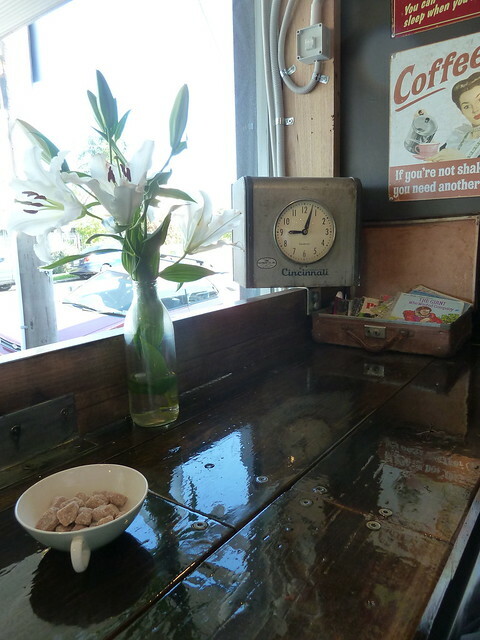 I'm loving our two new cafes, but it's time to take it back to the old school. This is a no baked eggs zone. No microbrew lattes. No smashed avocado - unless it's in a Vietnamese smoothie with heaps of condensed milk. 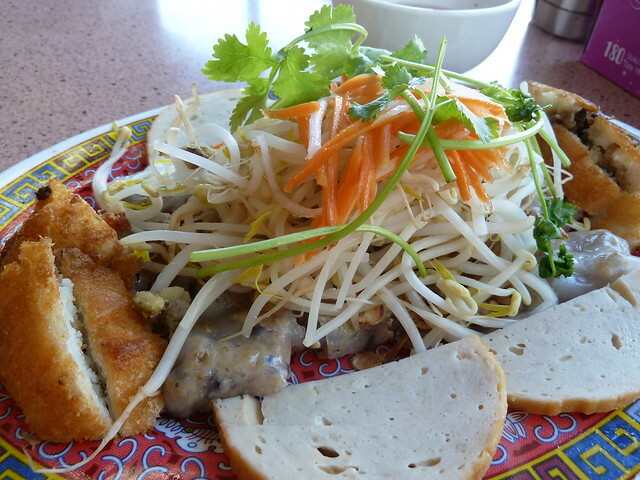 This plate of love is called banh cuon and it's amazing. At the bottom are fresh rice flour crepes, filled with minced pork and mushrooms and rolled up. The translucent rolls are topped with stacks of fresh, crunchy bean sprouts and herbs, while a smooth Vietnamese pork sausage (or cha lua) croons back-up harmonies. 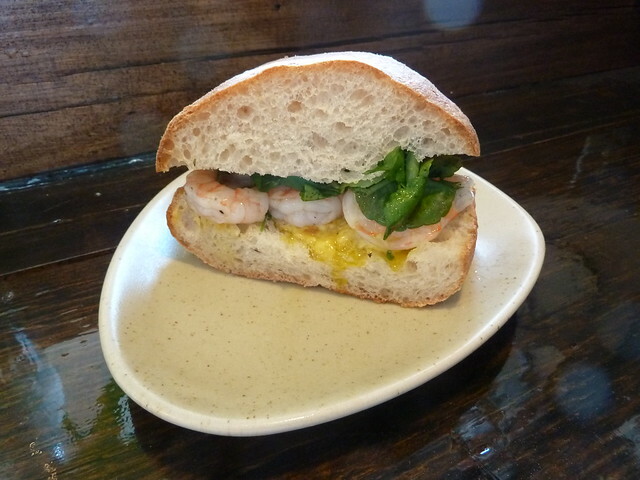 In the wings is a banh cong, a type of deep-fried glutinous rice flour muffin full of earthy whole mung beans. Drown it all with heaps of seasoned, sweet fish sauce. A refreshing, satisfying breakfast, with golden crunchy muffin, lightly savoury beans, rich pork in slippery rice pancake and a riot of salad crunch on top. 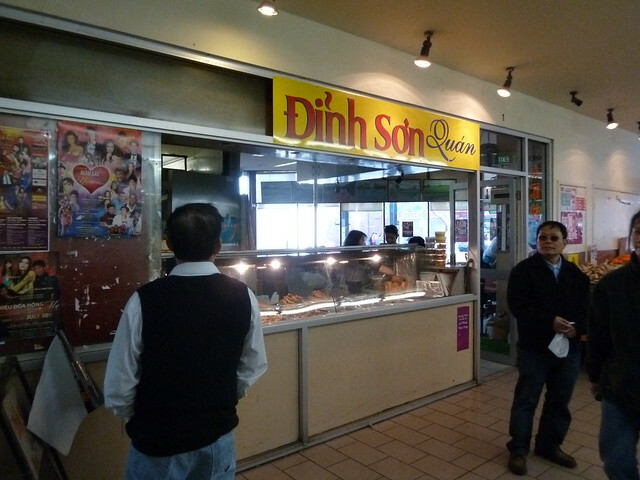 Dinh Son, an unassuming, very traditional cafe at the edge of Little Saigon market, is your purveyor of fine banh cuon. It's not on the menu so you have to know to ask for it (they understand my mangled Vietnamese, so you should be right. I say "banh kwon with everything" which does the job). On weekends you can sometimes catch the ladies making the crepes on a little stove near the front counter, filling each delicate crepe with pork mixture and teasing it gently from the blackened frypan. Oh, and did I mention it is EIGHT BUCKS? Yes. 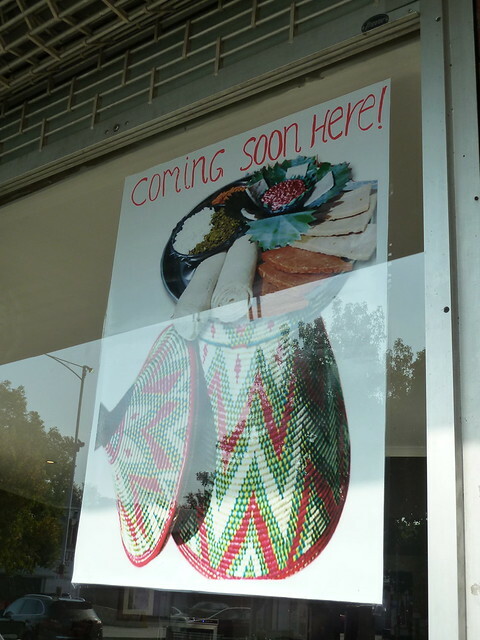 I don't think this bakery in Little Saigon Market is new, but it's had a bit of a revamp. They only seemed to do cakes before (including naturally purple Swiss rolls made with yams) but now have banh mi (Vietnamese rolls). 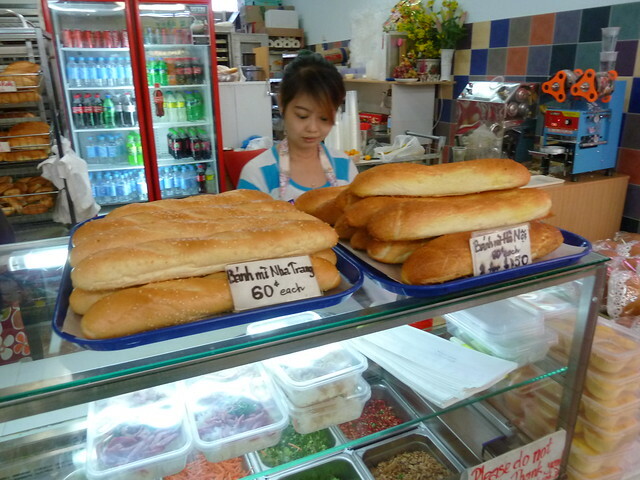 We grabbed two breadsticks, a banh mi Nha Trang (60 cents) and a banh mi Ha Noi (80 cents). 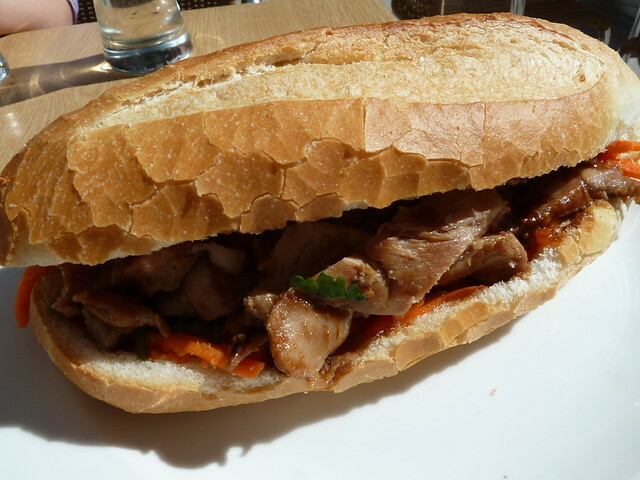 The Ha Noi version was particularly good, with a kind of crackle on top. On the hunt for the elusive single golden pagoda rice wine, which is the only one to buy apparently. 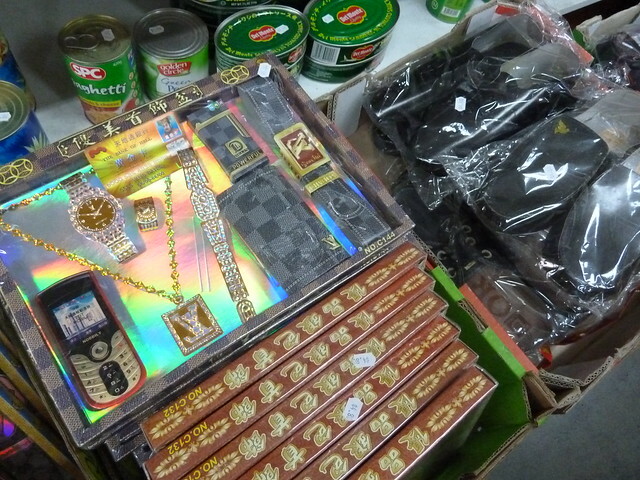 You will often see these in the Asian grocers of Footscray - boxed shirts, "luxury goods" sets and even 3D shoes, all made entirely of paper. They're for burning at funerals so that the dead can take their goods to the afterlife. My favourite place - the Yen Huot Gift Shop on Paisley Street, which a reader once told me they call "the Emporium". Every imaginable thing is for sale here, from toys like the Barbie-esque "Benign Girl" to plastic kids bottles that look ripe for a recall. I swear each time they get a new delivery, they just scatter the new stock on top of the old. I wouldn't be surprised if there was an entire Vietnamese grandma and accompanying shopping cart entombed under a cascade of crappy toys. It's so disorganised but everyone shops there, the proprietors are lovely and there's no better place to buy my gas stove lighters ($1.50) and bobby pins and hair elastics (like, $1, compared to Coles' outrageous $5 or more prices for 10 stingy hair ties). What's this? 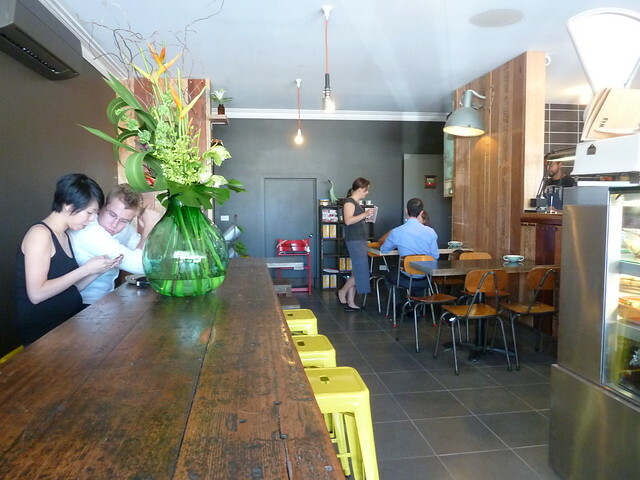 Another new Footscray cafe! 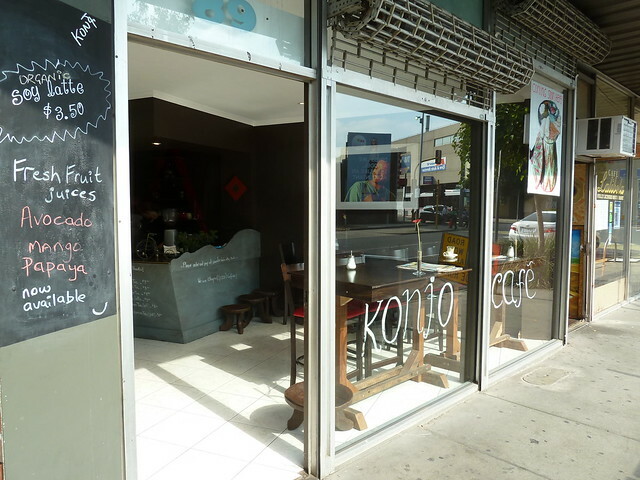 This is Konjo Cafe, and the owners have an original restaurant in Collingwood. 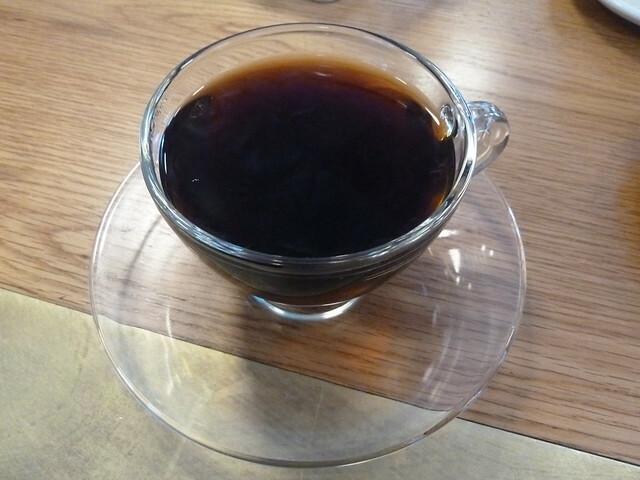 The coffee they use is Djimma from Ethiopia. They're only doing coffee at this stage but have a few bikkies on offer too. 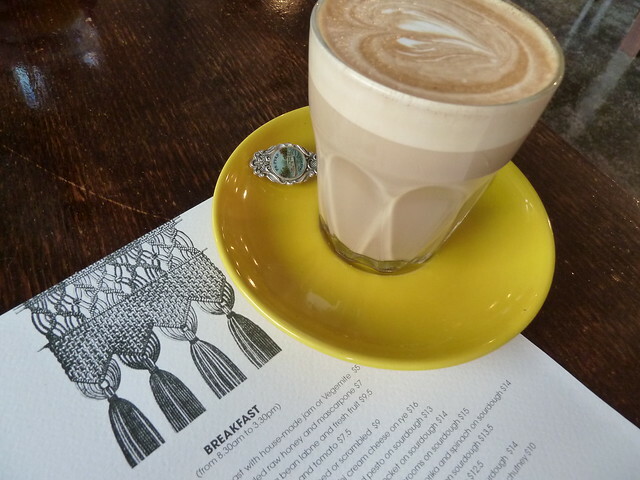 The milk wasn't as silky and luscious as it should ideally be, but the underlying flavour of the Djimma blend or variety was sweet, well balanced and delicious. OOH! That's exciting. Please tell me it's lunch time already?! 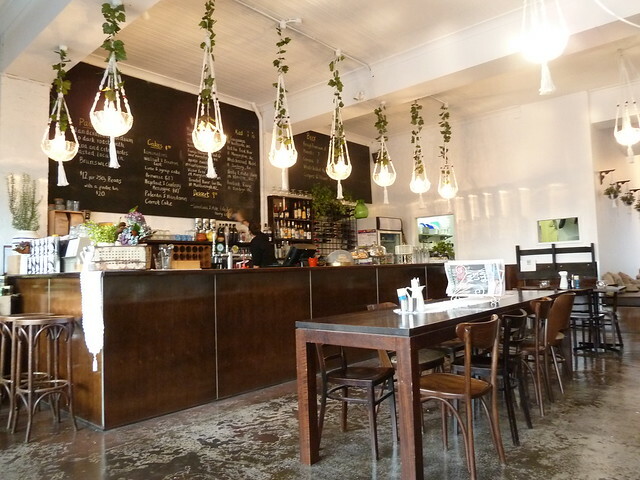 A new blog you should add to your reading list is "Krapow" by Andy and Tina, who are very knowledgeable about Thai and Vietnamese food. 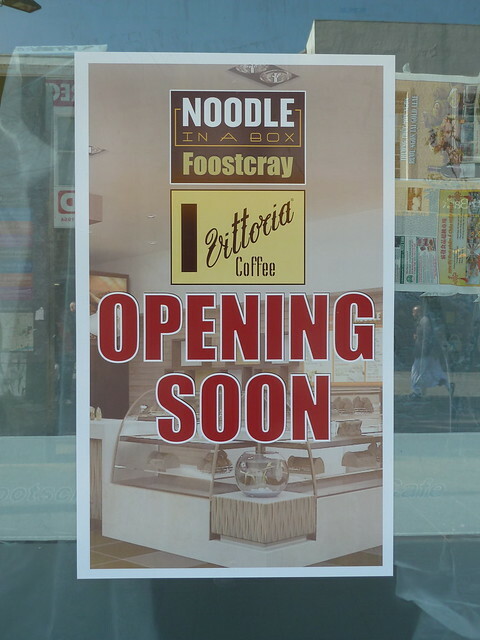 As well as unearthing some winning "secret" Asian eateries in the CBD, they're extremely passionate about Footscray. 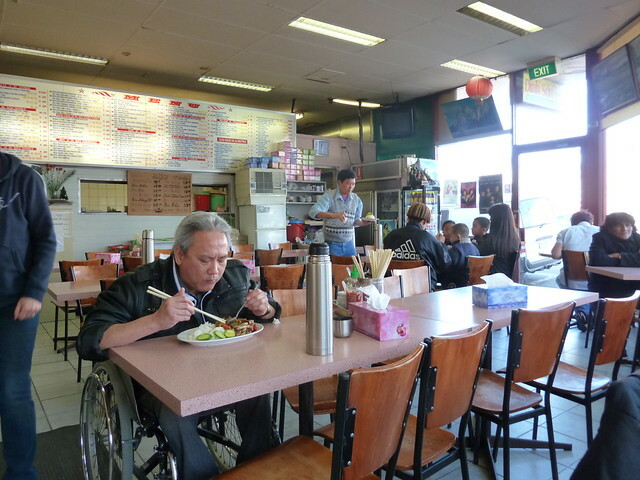 For starters check out their wrap of the New Year Festival, Vietnamese snacks in Footscray, and $5 crab from Dinh Son. And at risk of losing my opportunity to win it, also check out their (non-sponsored, non-PR) Meera Freeman cookbook giveaway! Was Touks, now... Chicco! The newest member of the Seddon family has grace and poise, but is still friendly and inviting. The decor is gorgeous - if you squint your eyes, you could be in a coffee plantation out of an Isabel Allende novel. Hanging baskets with curling creepers, old lace atop dark wood tables and cushions fashioned from old coffee sacks. 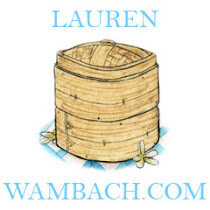 It sounds whimsical but it isn't - everything works together harmoniously. 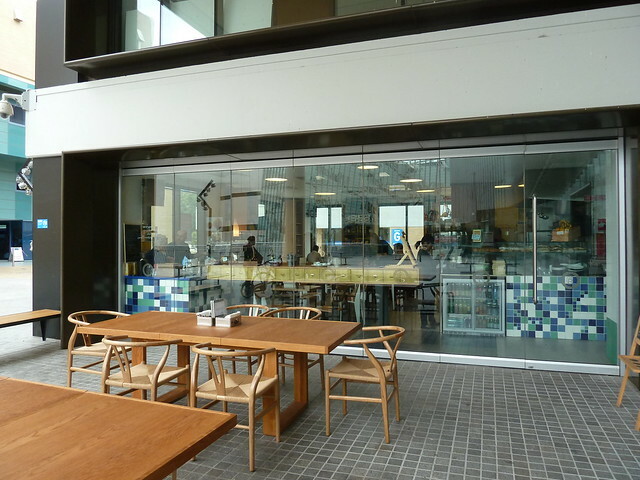 The floor is cool polished concrete, each table has nice salt on it, and the front windows open right up to create a big, airy and refreshing space. 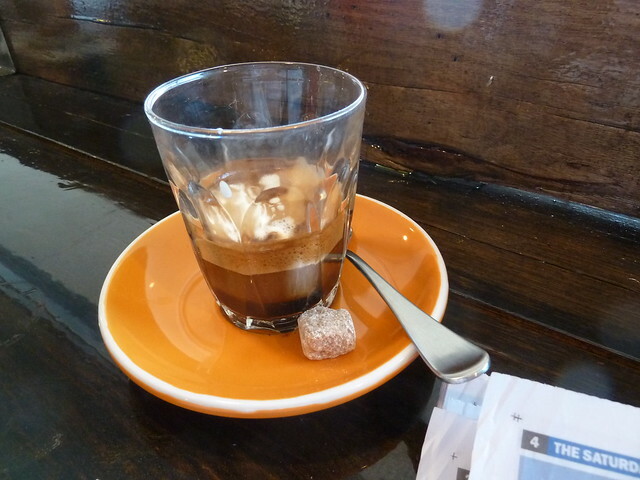 Chicco use Padre coffee, as do Footscray Milking Station, locally roasted in Brunswick. This wasn't quite as velvety as a latte from the Milking Station, which might have something to do with MS's primo Slayer machine. Still, a very nice cup. Babycinos are just too adorable! I love the menu - it's visually appealing and adventurous in its content. Breakfast veers away from boring build-your-own plates to dabble in unusual touches like eggs with dukkah (a Middle Eastern nut and spice mix), minted eggplant puree, beetroot relish and house-cured salmon. There's organic bacon as an extra, as well as chillies! 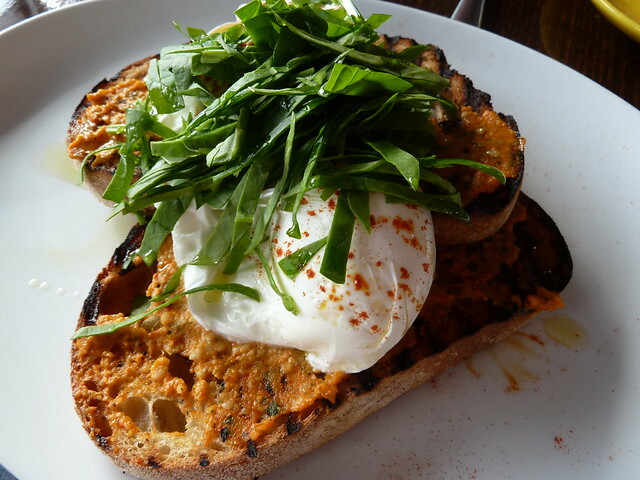 These poached eggs were glorious, on great Dench bread spread with fantastic, rich red capsicum and cashew pesto. Earthy smoked paprika was complemented by a herbaceous drizzle of good olive oil. Simple yet smart, and seriously yummy. There's a kids' section of the menu that is intelligent and well priced, and therefore BRILLIANT. 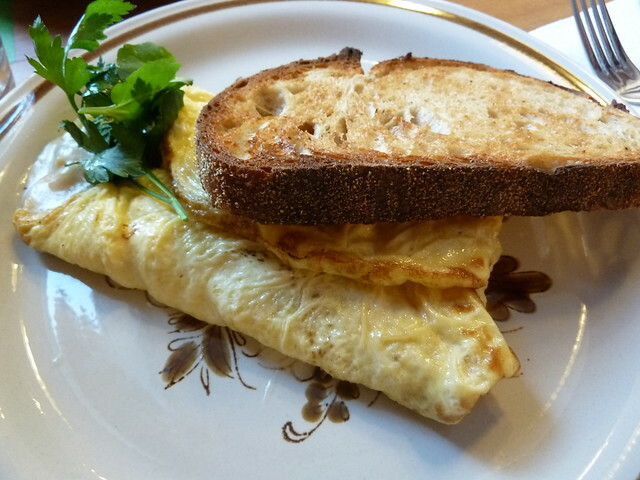 Scrambled eggs on proper toast ($4) went down a treat, and I love these old school jaffles! 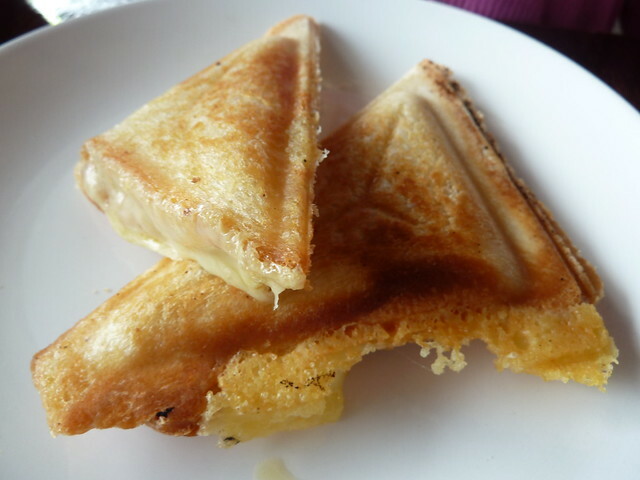 Once upon a time, before sandwich, I mean, panini makers went all flat-plated on us, many an after-school snack was made like this. The edges are crimped down to create two golden hot pockets of melty yellow cheese. 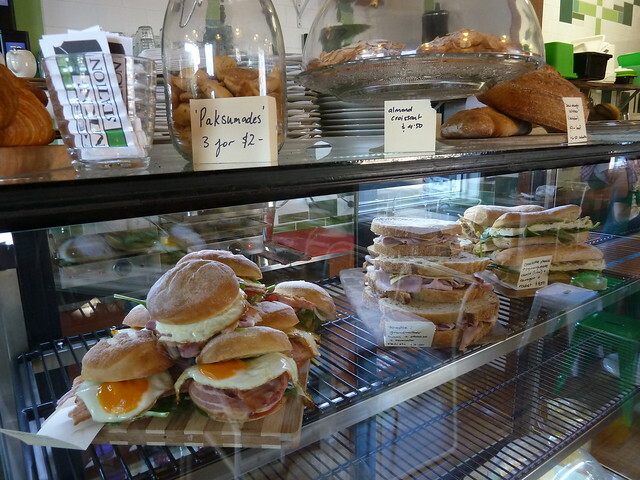 The lunch menu looks great, with a free range chicken schnitzel with Italian slaw and garlic aioli I've got my eye on. They're licensed and have a couple of fun ciders on the menu. Sweets continue to gently bend the boundaries with a walnut and bourbon tart, as well as old school lamingtons. I can't wait to try more of Chicco's confident and clever menu. 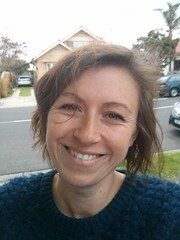 What a lovely fresh face in Seddon village. 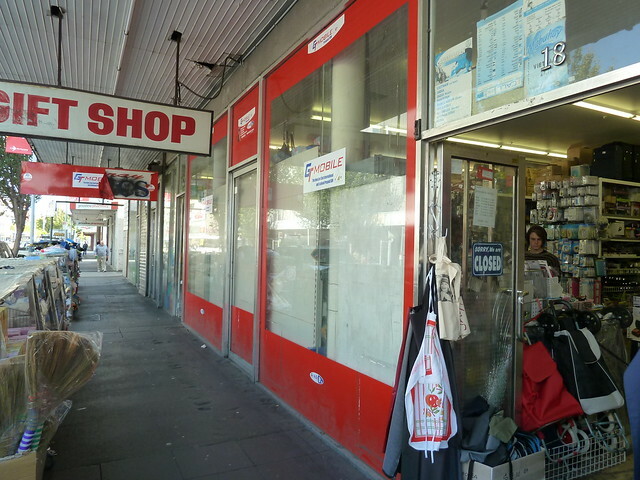 Footscray, have we arrived? The Milking Station would fit in perfectly in any uber-groovy precinct of inner Melbourne, but these lovely folk chose to take up digs here. 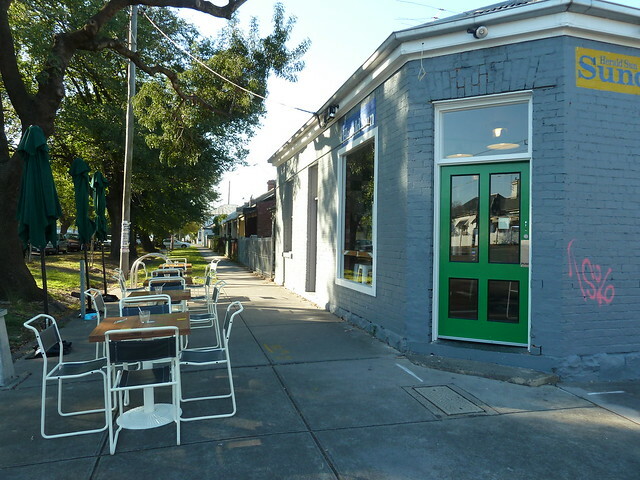 Nestled in a country-feel pocket of Footscray where the wide streets are lined with big, old trees, this brand-new neighbourhood cafe serves gorgeous coffee by Melbourne micro-roaster Padre. This spot used to be the milking sheds for a local faming family. This past is recalled by silver milk pails and vintage glass pints of milk for water bottles. 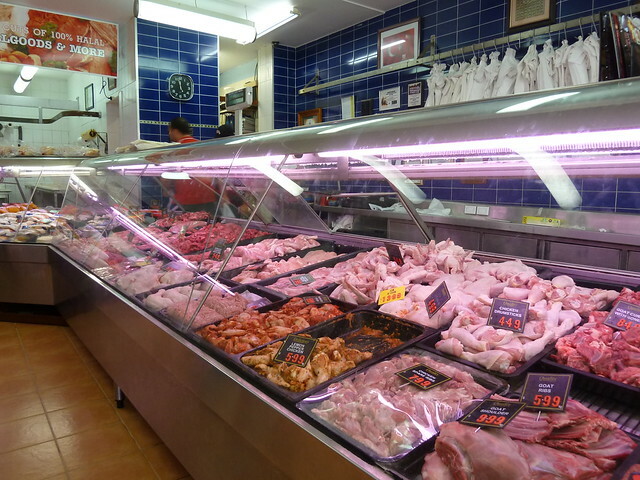 In the cabinet inside, big rosy red sausages twirl on their strings and hint at plans for a full deli range. 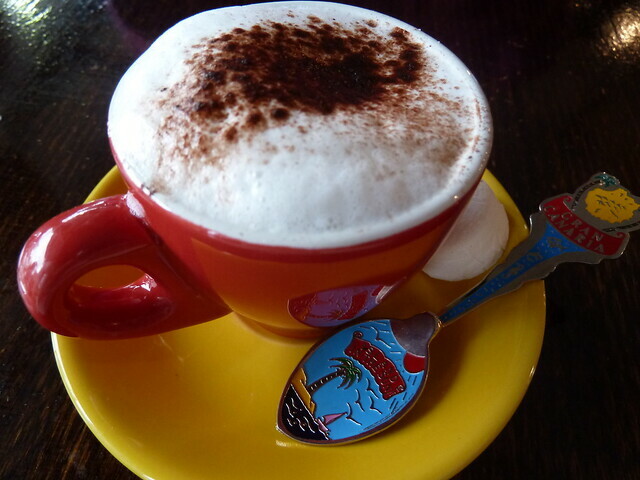 I love the coffee here - it's just luscious. They use a Slayer, which is a semi-manual machine that allows the barista more control over when the extraction begins. Water can be added to the group and the process thus paused for, say, 10 seconds before extraction starts. This allows the coffee to be soaked and therefore more flavours to be teased out. It's a similar theory which underlies the Clever Dripper filter device that Besito use - it only starts draining when it's placed on the cup, thus ensuring all the ground coffee is thoroughly soaked for maximum flavour extraction. A gorgeous omelette filled with oozing, bitey taleggio and asparagus wrapped in rich, savoury prosciutto. Digging the nannacore plates. Simple eggs and bacon, the eggs popping open to reveal liquid golden yolks. Great bacon too, with a slightly smoky flavour and proper, dense meaty texture. Panini and sandwiches are tempting, and there's a full lunch menu including a pulled pork sandwich that's winning lots of fans. 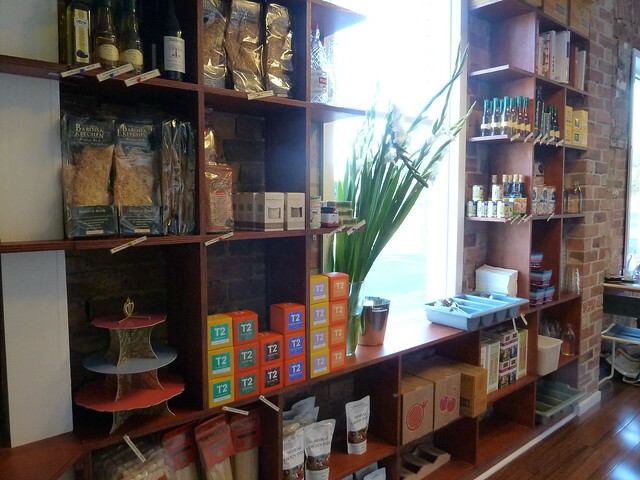 There's a well-thought out range of dry goods including wholegrain Pangkarra pasta made in South Australia and some Latin American tastes like salsas and mole sauce. 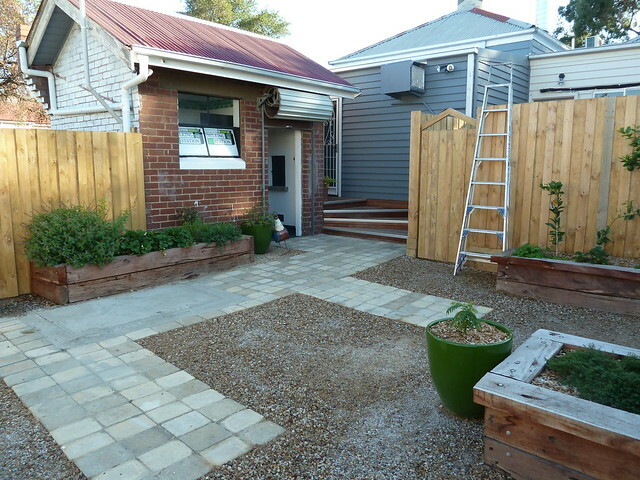 Out the back, the newly-renovated toilet block is part of the original dairy setup. The garden outside is the template for an inner-urban backyard, with pristine raised beds filled with herbs and big red strawberries that beg to be fossicked for. As well as excellent freshly-squeezed OJ, there's the full dentist-repelling range of Mexican Jarritos soda pop. 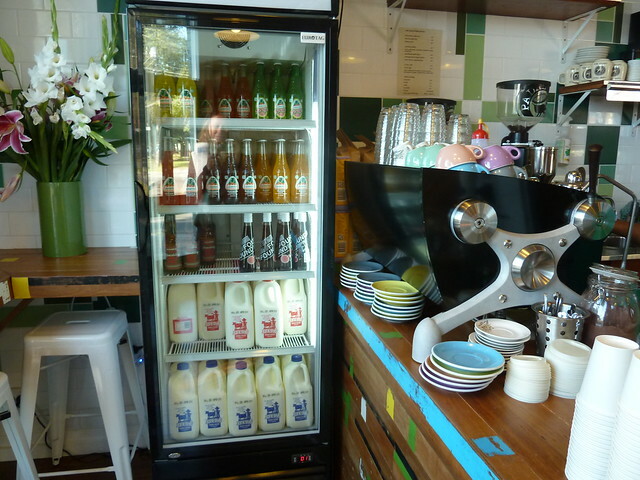 And of course they use (and sell) Jonesy's Milk - anything less and the old dairy folk would be spinning. 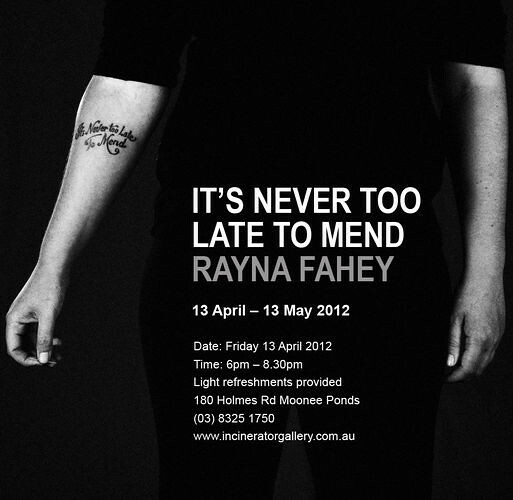 Opening tonight - local identity Rayna's solo exhibition, taking craft to a new, subversive level. From Incinerator Gallery: "Fahey is best known for reclaiming ugly industrial settings and transforming them through conscious craft love". 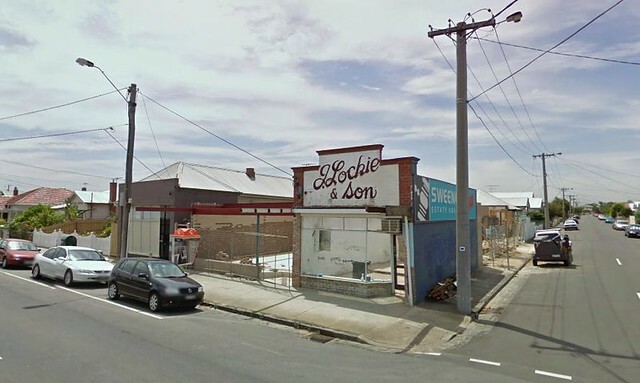 I love her series through the chain fencing of vacant blocks around Maribyrnong, gently demanding of property speculators, "What else could go here?" Read more in Time Out and on her blog at radicalcrossstitch.com. Waiting in the line, juggling books and backpack, my mobile rang. "Oh hi Dad. How are you? Just a minute, I have to order my coffee. Yes, I'll have a latte with caramel syrup, please. "...after all the places I've taken you...all I've tried to teach you...this is how you repay me. CARAMEL SYRUP! WHAT ARE YOU THINKING!!?!" True story. It wasn't my fault, though. My university cafe made what I am sure was certifiably the world's worst coffee - pallid, stinking of wet, burnt grinds, its insipid foam deteriorating with the first desperate blow across its surface as one tried to cool the magma-like liquid beneath. Syrup was the only thing that made it drinkable. 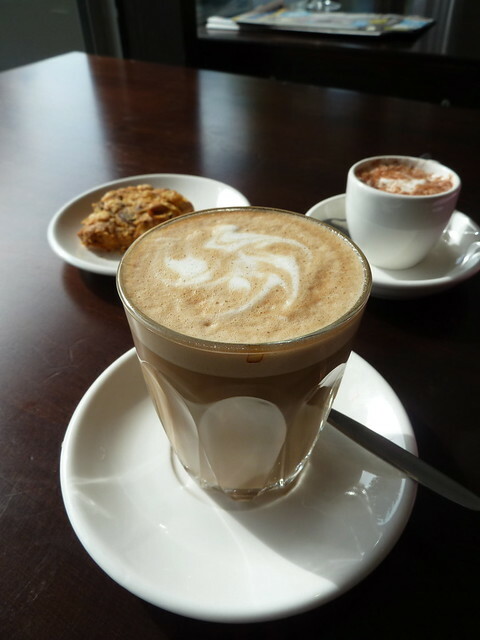 Well, I obviously didn't go to Vic Uni, the students at which are absolutely spoilt rotton with the Reading Room cafe who do fabulous specialty coffee. 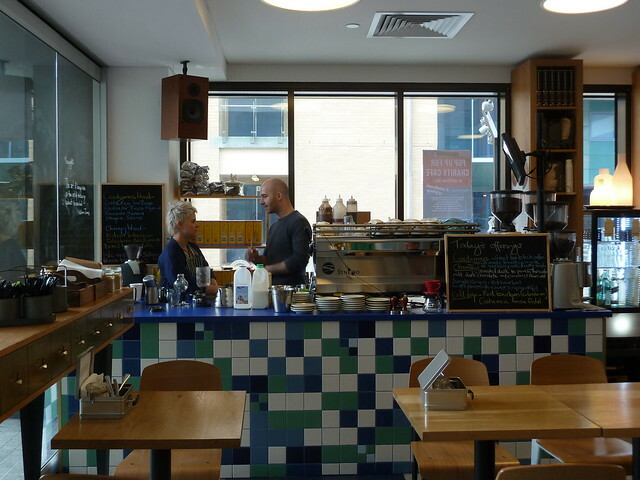 They use a Synesso and have three separate grinders buzzing madly all day long. 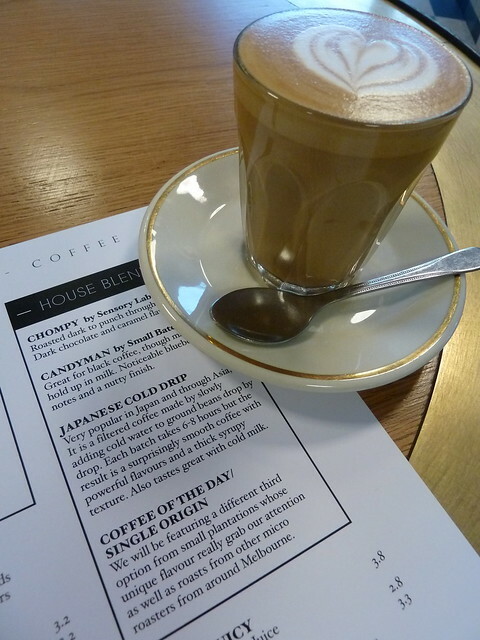 Even a bog-standard latte gets the choice of Candyman by Small Batch, Chompy by Sensory Lab and a regularly-changing single origin. Best of all, it's open to the public! I have gone down in the week when it is abuzz with students but I feel a bit left out without my yellow highlighter and giant brick of readings. 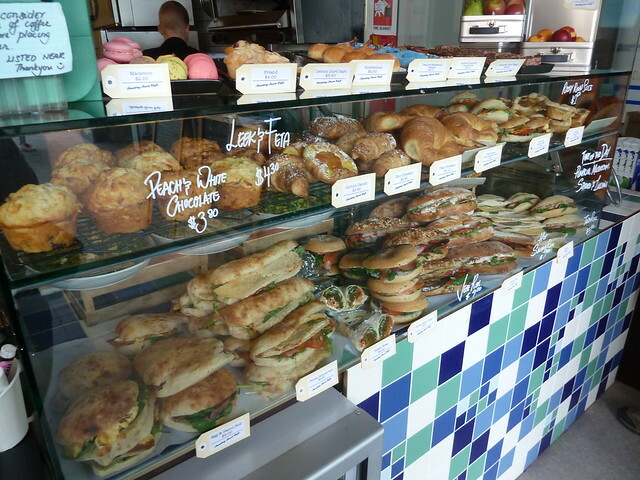 On weekdays there's a huge spread of ready-to-go quality sangers plus a full a la carte menu. 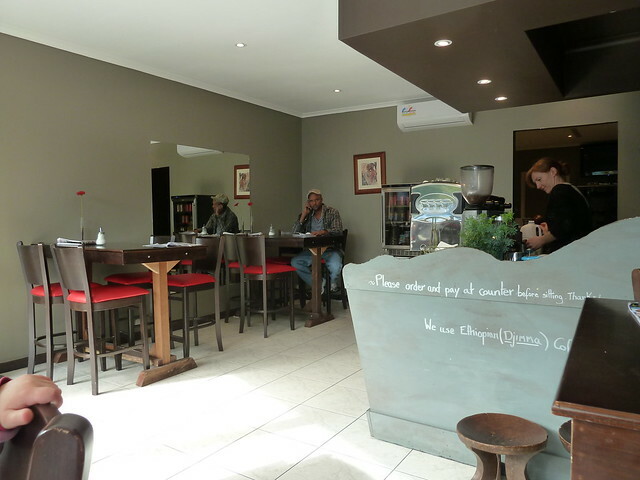 The hot tip is it's now open on weekends with a totally different, chilled-out atmosphere and special breakfast, lunch and high tea menu. Reading Room invited me to check it out as their guest. 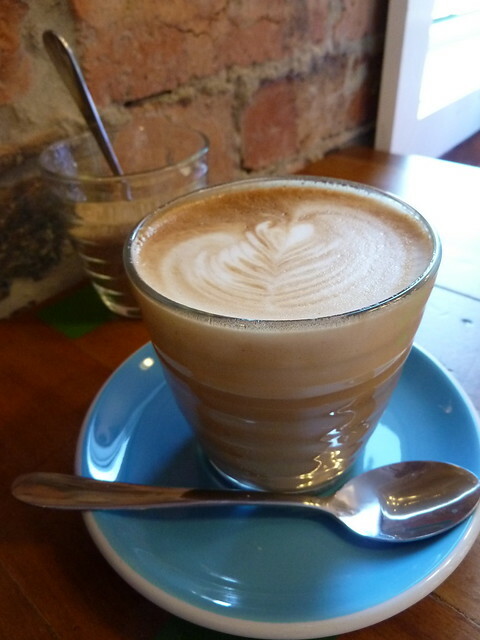 Oh, such consistently great coffee. I love the Chompy in particular. 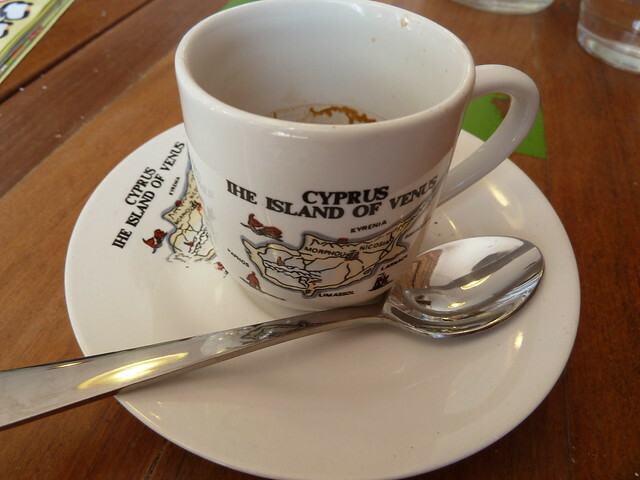 The single origins are always nice to have as an espresso so you can really taste the varietals. I know that sounds wanky but honestly, if you give it a try - especially with two different blends next to each other - you'll really notice the difference. 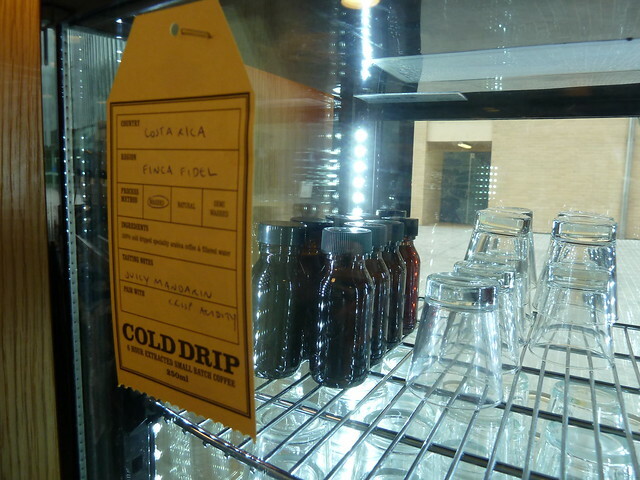 Reading Room have espresso and cold drip available in the week, while on weekends they also offer siphon and pourover. 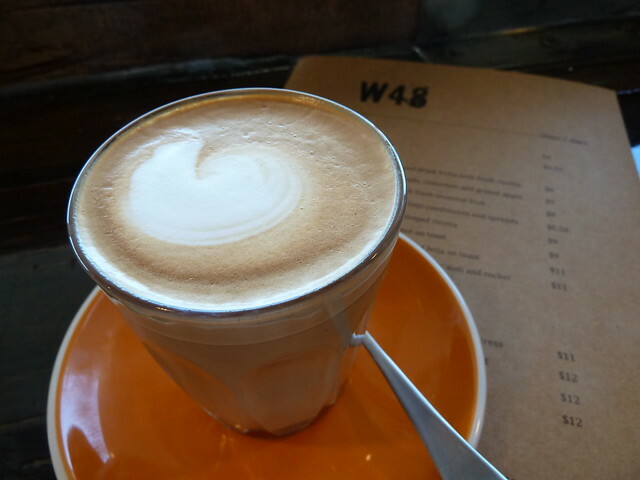 Melbourne, I know it's hard to wrench ourselves away from the espresso machine teat, but the new brewing methods of coffee are really worth trying. When done right, the coffee is so flavoursome you honestly can't bear to add milk or sugar. 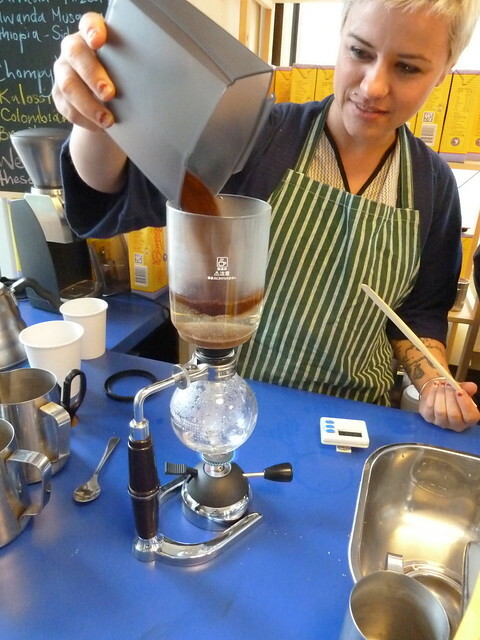 This siphon method is like a science experiment - the water is sucked first up and then down due to changes in pressure, mingling with the coffee in the top bulb before being forced down to the lower and leaving the grounds behind. Somewhat similar to filter but with an even more crisp finish, it had such a clean taste with pleasant red berry acidity. The food is really nice. It doesn't break through the sound barrier, but it's well made, generous in serves and tasty. 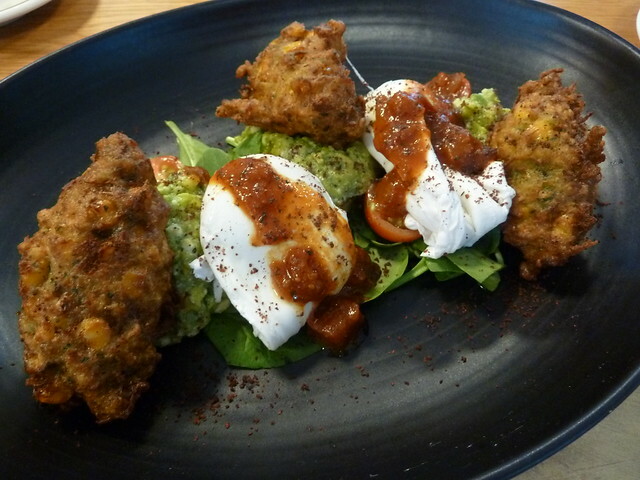 My fritters were fresh and super crispy, quite lovely with the avo smash. The sunny spill of egg yolk was so pretty against the matt black plate. DIY brekkie was an easy choice with roasted tommies and avocado and ricotta mash. 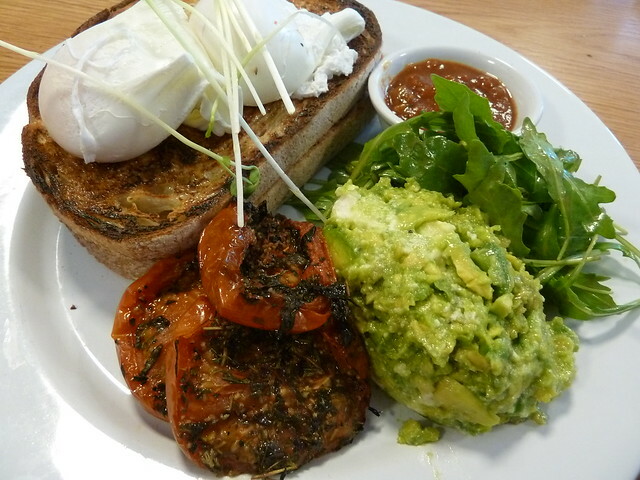 Loved the dry-cured bacon (out of shot is my greedy side order to go with my virtuous-looking vego fritters, heh heh). 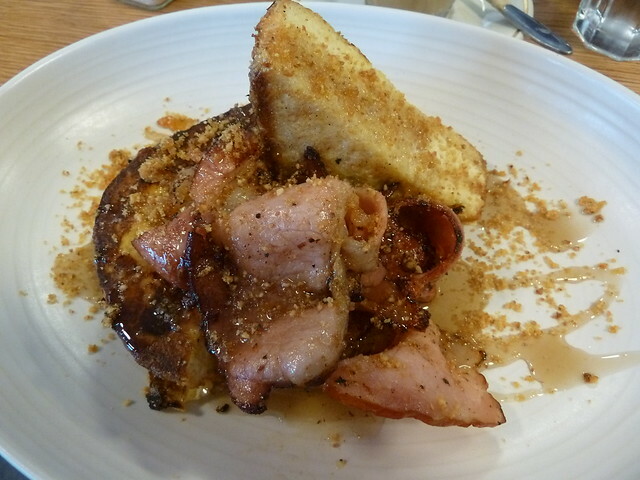 "The BFG" looked super indulgent with more of that fabulous bacon curling around big slabs of brioche French toast and covered in maple syrup and crushed candied walnuts. 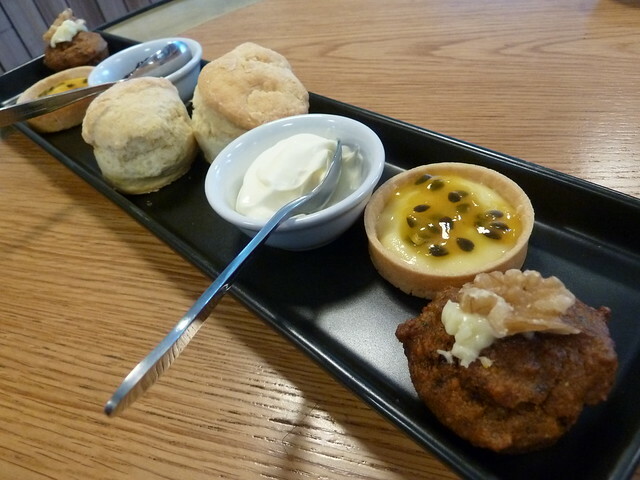 J remarked that with her Filipino heritage, it was quite familiar to her to combine sweets with savouries. 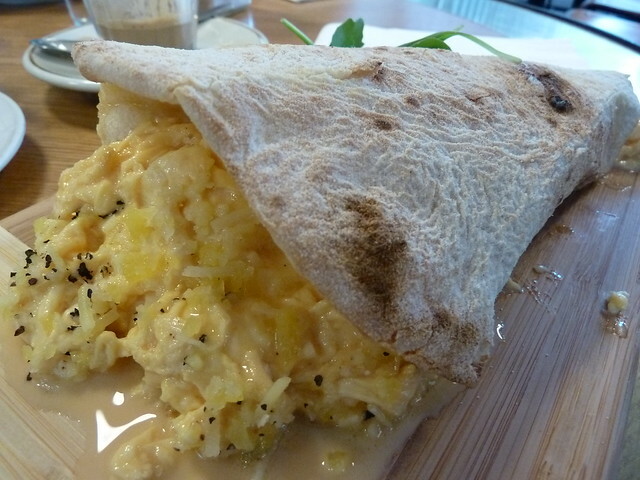 This breakfast piadina was filled with scrambled eggs, gruyere and shaved ham. 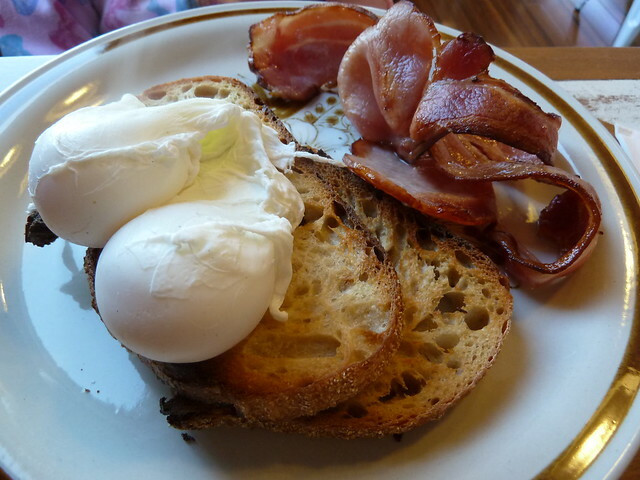 The eggs did look a bit watery but S loved the bread which was satisfyingly toothsome. Cakes were really fabulous - the scones were proper scones. One of the things I find most exciting is that the Reading Room is open until 6pm on a Saturday or Sunday. 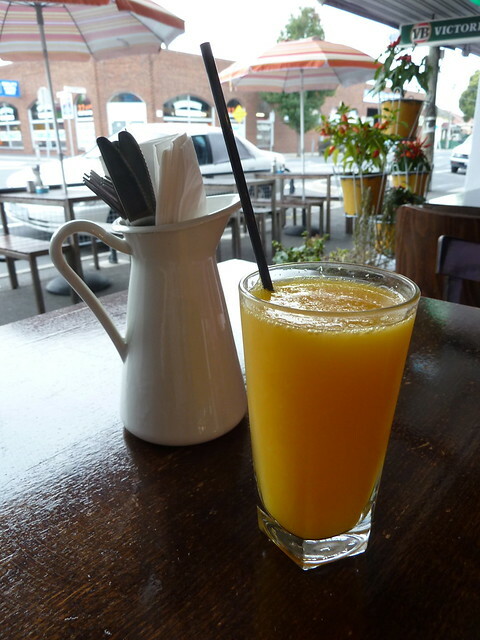 After 3pm it can get hard to find a cafe that will be open for much longer or where the kitchen's not closed. 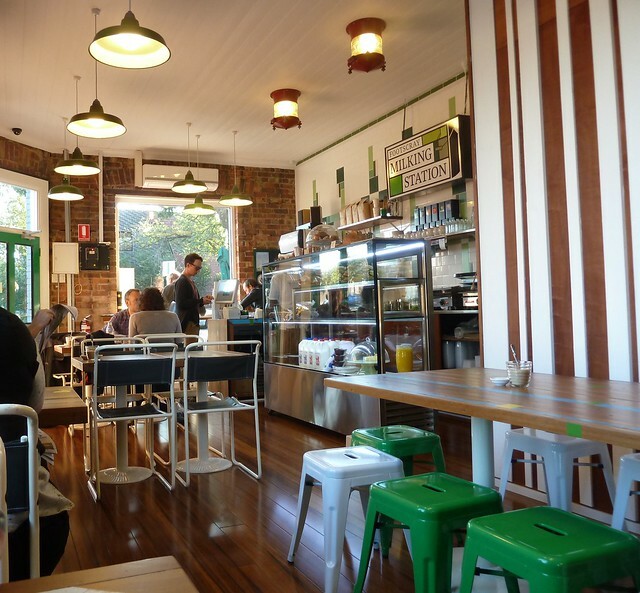 I look forward to dropping by in the late arvo for a coffee or a spot of high tea, which involves a three-tiered stand with sweets and savouries, like chicken and tarragon sandwiches. Ooh la la. Check out the website for details of The Reading Room's charity giving initiative over the next eight weeks. There's heaps of room on the forecourt outside for kids to go mental. Footscray Park is right next door too which is a delight to meander through with a takeaway coffee, down to the river with that gorgeous view of the city which always makes me think how lucky I am to live here. Disclosure: The above meal at The Reading Room was provided free of charge by the owners to me and three guests as part of their weekend trading launch campaign. The offer was not conditional on me subsequently writing a post. The Reading Room has not been given any editorial control of this post.